The Irish Athletic Third-level Boxing Association are proud to announce details of the upcoming Irish Boxing Championships for College and University Students at the home of Irish Boxing, the National Stadium. Boxing: Contingent on entries, details to be announced after the competition draw. Note: The term “Elite” refers to age classification only and is not related to the ability or experience of the Boxer. Elite: Male and Female Competitors between the ages of 19 – 40 years old. Youth: Male and Female Competitors between the ages of 17-18 years old. Note: The Beginner Category is intended for Competitors that are in boxing for no more than a year. Competitors that are in boxing for more than 1 year (Boxing Record Book registered 2014 or earlier) must compete in the Novice Category regardless of the number of bouts on their record book. This prevents Competitors with more sparring experience obtaining an unfair advantage over Beginner Boxers. All Male Competitors with 10 or less bouts must include their date of registration on the Competition entry Form. Please note: Male & Female Competitors aged 18 years old on March 4th 2016 also have the option to enter an Elite Category. Competitors aged 17 years old are prohibited from entering an Elite Category. Competitors must be fully registered and hold a student card for the institution with which they are internally registered for the current academic year. Competitors must be pursuing a course of study that leads to an award ranked at a minimum of Level 6 on the Quality and Qualifications Ireland’s (QQI) framework of qualifications, or minimum Level 3 on the Northern Ireland National Qualifications Framework. Competitors must be members of the IABA, and members of an affiliated Boxing Club of the IABA. Competitors must produce their Boxing Medical Book and their valid Student Identification Card for the current academic year. Entries are subject to vetting and it is a condition of entry that all competitors and officials shall have signed the IABA Waiver / Members Acknowledgement Form. Important – Entries will only be accepted from third-level institutions’ Sports Officers / Students Services Staff, or from secretaries of recognized third-level boxing clubs. Boxers can only compete with the permission of their academic institutions’ sports officer or equivalent. Irish Athletic Third-level Boxing Association (IATBA) Boxing competitions are governed in accordance with the rules and regulations of the International Boxing Association (AIBA). The Official in Charge of the competition will follow the AIBA Open Boxing (AOB) Competition Rules. Each Competitor presented by his or her Club shall be fit to box. This is the responsibility of the Club. Competitors must have one Red and one Blue Vest. Coaches must wear tracksuits and trainers at all sessions, and endeavour to set a high standard of hygiene in the corners. Females competitors must wear headguards. Competitors with long hair must keep it contained within the headguard with a hair net or bandanna. Boxers must present themselves clean shaven for weigh-ins and bouts, and advise details of any medication they are taking, or have taken in the preceding 4 weeks. All body piercings must be removed before attending the weigh-in. Hair clips cannot be used. Gum Shields: Red or Orange coloured gumshields are forbidden. Any competitor entering the ring with either colour gumshield will not be allowed to box and a walkover to their opponent will be called. Entries will be accepted from Coaches and Secretaries of Third-level Boxing Clubs, and Sports Officers of Third-level Institutions. The entry form will be emailed to the above on request by email to iatba2010@gmail.com. The closing date for entries is Friday, March 4th 2016. Third-level institutions entering Competitors for IATBA Championships must pay a membership fee to the IATBA for the year. Sport Officers / Club Officials are requested to contact IATBA to organize affiliation as soon as possible in order to facilitate the administration of the Championships. Dublin City University Boxing Club will host the inaugural Darren Sutherland Memorial Cup in “The Venue” in the DCU Student’s Union on Monday March 31. Doors open at 7.15 pm. This event is a tribute to the late Darren Sutherland, an Irish Elite middleweight champion and Olympic Bronze medalist, boxing out of St. Saviours BC, and a student of Sports Science in DCU. A DCU/St. Saviours team will take on an Irish Third-level select, comprising of student boxers from other institutions. DCU boxing club were the most successful club at the recent Irish Amateur Third-level Boxing Association Championships, winning 8 gold and 3 silver medals, and will undoubtedly provide a stern challenge to the Irish third-level team. Both teams will be keen to win the cup and the very best of Irish student boxing will be showcased. Tickets for the show are a student friendly €5 and are available to purchase in advance online. Click here . Tickets can also be bought at the door on the night. Further information on the show is available by clicking on the event poster below. The fifth I.A.T.B.A. Championships finals took place at the National Boxing Stadium on Saturday March 15th 2014. There were 21 contests on the program and the best of third-level boxing was on show. Results of the finals are here. National Third-Level Open Intervarsity for Novice, Intermediate and Senior boxers. The IATBA are the only boxing body recognized by CUSAI at third-level in Ireland. These competitions are open to current students in all CUSAI member institutions. First Weigh-in: Saturday 23rd 11:30 am-12:30 pm (All boxers must weigh-in each day they box). All weigh-ins take place in the Ringside Club adjoining the National Stadium. Colleges can pre-enter boxers at their expected weights. Any late entries will incur an increased entry fee of €15. The tournament entry form is available to download (click here). Club secretaries or individual boxers are to email entry forms to their Institution’s Sports Officer (or equivalent), to then be forwarded to iatba.2010@gmail.com. Contact information for CUSAI member Sports Officers is available here. 1. 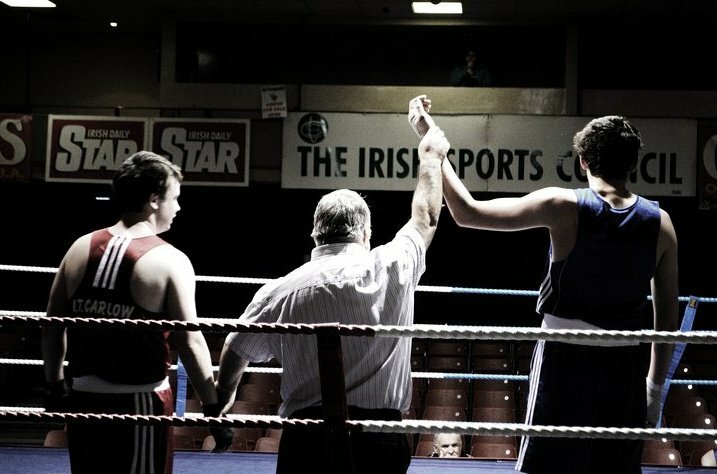 Institutions entering boxers in IATBA organized competitions must be affiliated to the Colleges and Universities Sports Association of Ireland (CUSAI) and to the IATBA for the current academic year. 2. A student must be fully registered and hold a student card for the institution with which they are internally registered for the current academic year. Students must be pursuing a course of study that leads to an award ranked at a minimum of Level 6 on the National Qualification Authority of Ireland framework, or the equivalent Level 4 on the Northern Ireland National Qualifications Framework, or Level C on the Northern Ireland FHEQ. 3. Boxers must be over 17 years of age and under 35 years of age. The draw will take place following the weigh-in and boxing will commence at the time specified at the weigh-in. Times for boxing on Saturday and Sunday will be made known to the competitors following the draw. Food will be available at a reasonable price in the Ringside Club canteen at the Stadium, throughout the competition. Attention is drawn to the change in weigh-in time on the first day from the time previously mentioned in the circular on our website. First weigh-in will now be on Saturday from 11:30 am-12:30 pm (to accommodate boxers travelling up long distances on the day). All other details will be dependent on numbers entering. Weights for Novice & Intermediate Boxers will be – 48KG, 51KG, 54KG, 57KG, 60KG, 64KG, 67KG, 71KG, 75KG, 81KG, 86KG, 91KG, 91+KG. Weights for Senior Boxers will be – 49KG, 52KG, 56KG, 60KG, 64KG, 69KG, 75KG, 81KG, 91KG, 91+KG. Membership Fee: €50 payable to the IATBA at the first weigh-in, for any college who has not paid for 2012/13 (i.e. those institutions not listed here: https://iatba.ie/memberinstitutions/). 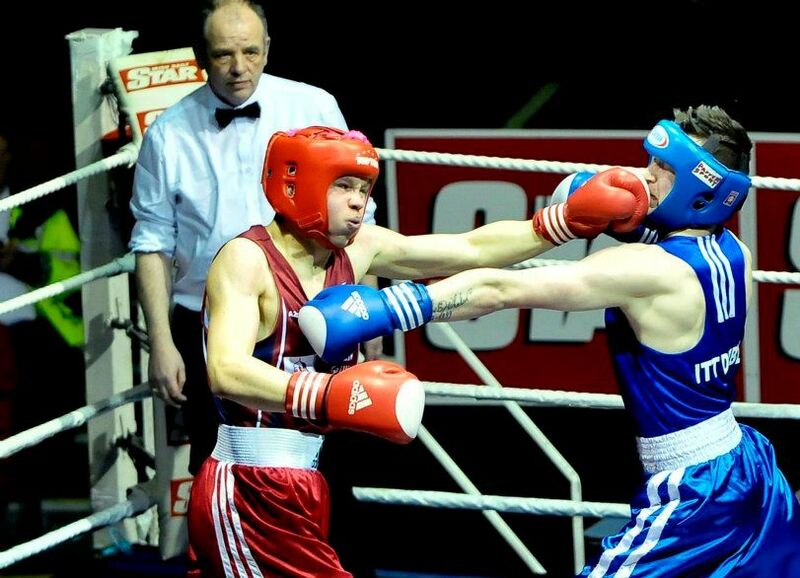 The Irish Amateur Third-level Boxing Association will be hosting an invitational tournament on Saturday, December 15th in the Ringside Club at the National Boxing Stadium, Dublin. This tournament would suit all boxers looking to gain competitive experience as Novice boxers before the IATBA Championships in Feb/Mar 2013. The tournament is open to male and female student boxers from Novice up to Senior standard. Boxers will be matched on weight and experience. All boxers wishing to enter should complete the competition entry form (click here). The college club email their boxers’ entry forms to their institution’s Head of Sport (Sports Officer), who should then forward the entries to iatba.2010@gmail.com. In colleges where there is no active club, boxers email their entry form directly to the Sports Officer. For this tournament, and all successive tournaments, IATBA will only accept entries from third-level Sports Officers. A €5 entry fee per boxer applies. A cover charge for all spectators of €5 will also be in operation. A check weigh-in will take place on the day to ensure no mismatches have occurred in terms of the weights of the boxers involved. A provisional start time of 1pm is envisaged with the check weigh-in taking place in the preceding hour. This start time is subject to change, depending on entries received. Entries must be received by 5pm on Wednesday, 12th December, 2012. All boxers will be charged a €5 entry fee; payable at the scales. Boxers will be asked to show their student I.D card before weighing in. All boxers must have an IABA boxing record book. All Boxers must provide their own AIBA STANDARD & STAMPED head guard. Gloves will be provided. No red/orange gum shields allowed. Colleges are encouraged to wear their club colours if they have them, and to bring red and blue strips in case of a clash of colours. Colleges must also return a completed IATBA Member Institutions form (click here), if they have not done so already, before entering boxers for this tournament.